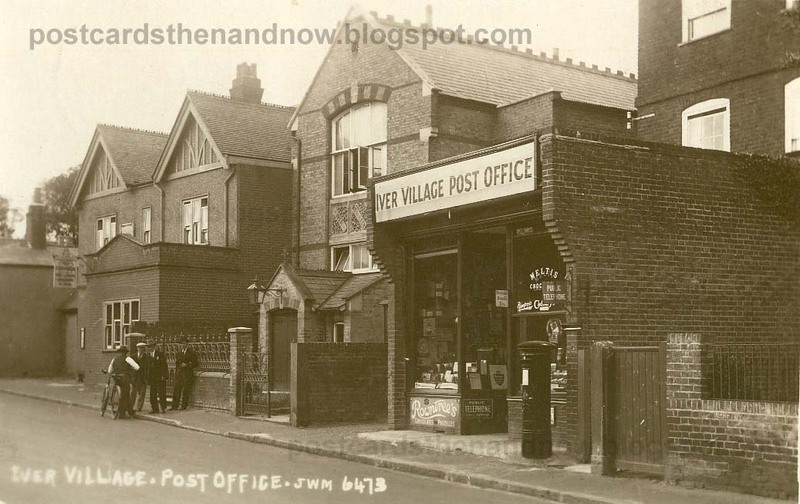 Iver Village, Buckinghamshire, the High Street showing the post office, circa 1928. Postcard by JWM - Joseph Warren Mortimer. Mortimer was the successor to the W. H. Applebee postcard business, though he was only in business for a few years. The message on the back of this postcard states that the sender bought this postcard in the post office pictured. The men are standing outside a Wesleyan chapel, this was later replaced by a much smaller version and is now a nursery. The building on the left is the Chequers pub. So, is that still the post office? I certainly hope so. We are often faced with the closure of small post offices these days, and, of course, they are the best ones. Alas, this building is now an estate agent. Iver does still have a post office though, it has moved a little way down the street. I remember Iver well when I lived in Langley. It was always a charming place. I have only passed through the station in recent years and hope that it has retained its charm.